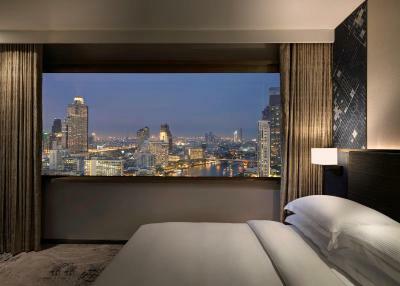 Lock in a great price for Millennium Hilton Bangkok – rated 8.2 by recent guests! Breakfast good selection. View from dining room great. Location was good being near Icon Siam and once I figured out how to take the little ferry across the river. Room was very comfortable and quiet. View may be not as spectacular as from Royal Orchid Sheraton with their comfortable lounge chair in the window. The location was great. Lobby decorated so well. Boat shuttle was good. Wifi was great. It was comfortable and clean. The staff was exceptional from the check in to checkout. The concierge desk was also very helpful with our numerous questions. I thought from some reviews I had read that the hotel might be a little tired and was pleased that our room was lovely. I love a hotel which provides an iron in the room! We spent the first night in the rooftop bar...perfect introduction to Bangkok. Another night we spent a lot of time wandering the new mega mall next door. The ICONSiam recently opened and it is amazing. Great entertainment even if you are not a shopper. The river view is fabulous and we were very well looked after on our wedding anniversary. Very comfortable hotel in a great location. View out over the river from our 25th floor room was fabulous. We got moved to another room with a better view without any problems. It was right on the river which was nice when you wanted to get to places you could use the water taxi! Location was perfect it has a beautiful river view, close to a brand new mall, and a market. Staff was extremely friendly and warm. Would definitely stay again next time we are in Bangkok. Excellence location and stunning view. Clean room and comfort. 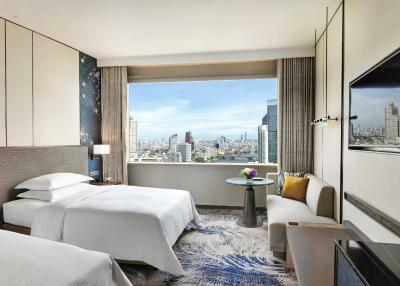 Millennium Hilton Bangkok This rating is a reflection of how the property compares to the industry standard when it comes to price, facilities and services available. It's based on a self-evaluation by the property. Use this rating to help choose your stay! One of our top picks in Bangkok.Located on the banks of the Chao Phraya River, Millennium Hilton Bangkok offers free shuttle boat service from its private pier to Saphan Taksin BTS Skytrain Station and Asiatique the Riverfront. 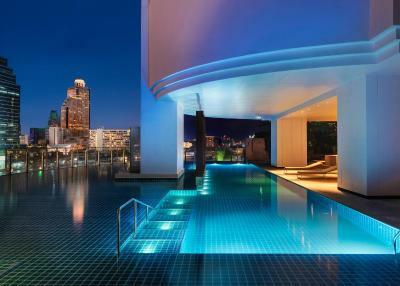 This contemporary 5-star property has 4 dining options, 24-hour gym and world-class spa. Free WiFi is available in public areas. All rooms feature splendid views of the river and modern interiors. They come with a flat-screen cable TV, mini-bar and safety deposit box. A bathtub and free toiletries are included in an private bathroom. Some rooms have an iPod docking station and DVD player. 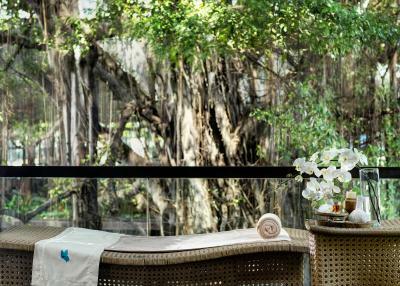 Guests can indulge in a variety of spa and beauty treatments at eforea. Those who seek some sun can head to The Beach, equipped with a 50 feet infinity edge pool and spa pools. The hotel also has 17 meeting rooms, 24-hour front desk and tour desk. All the dining outlets have open kitchens and river views. Flow offers an all-day-dining menu and the ultimate Sunday Brunch. Cantonese specialties and special selections of tea are served at Yuan while gourmet steak and seafood can be enjoyed at Prime. Guests can cool down with cocktails and panoramic views of the city at ThreeSixty Lounge. Signature desserts and artisan chocolate can be sampled at The Lantern. The hotel is located next to Khlong San Market. It is a short boat ride away from Asiatique Shopping Mall and Wat Arun. 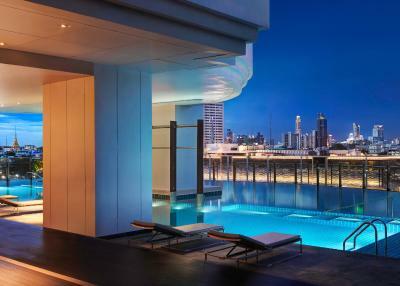 When would you like to stay at Millennium Hilton Bangkok? 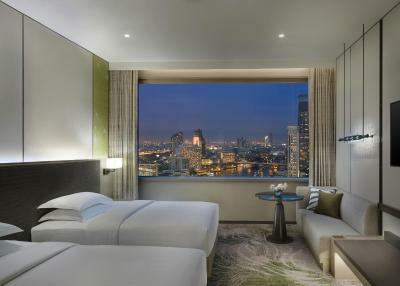 Room features sweeping river and city views. It has a flat-screen cable TV, minibar and safe. A private bathroom comes with a bathtub and separate walk-in shower. Slippers and bathrobes are provided. Located on a higher floor, this room features sweeping river views. It has a flat-screen cable TV, mini-bar and safety deposit box. An private bathroom comes with a spa bath and rain shower. Slippers and bathrobes are provided. Guests enjoy access to the Executive Lounge with exclusive benefits. - Light refreshments from 11:00-15:00 hrs. - Afternoon tea from 15:00-17:00 hrs. - Evening cocktails from 17:30-19:30 hrs. Stylish suite features panoramic views of the river and city. It has 2 bathrooms and a separate living room. It comes with a 42-inch flat-screen cable TV, mini-bar and safety deposit box. An private bathroom comes with a spa bath and a separate shower. Slippers and bathrobes are provided. Guests enjoy free capsule coffee, and have an access to Executive Lounge with complimentary breakfast and refreshments. 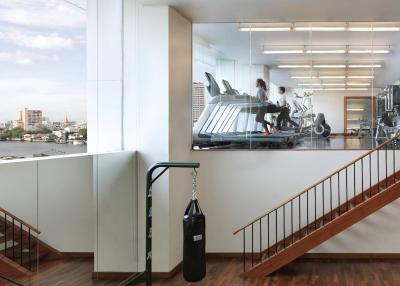 - Access to the Executive Lounge on the the 31st floor with panoramic views. Open daily from 06:00-21:00 hrs. Above benefits are for 2 guests. Additional guests will have an extra charge. Larger than Hilton Deluxe Room, the unit features sweeping river and city views. It has a 42-inch flat-screen cable TV, DVD player and seating area. It includes an iPod docking station, mini-bar and safety deposit box. An private bathroom comes with a bathtub and separate walk-in shower. Slippers, bathrobes and free toiletries are provided. This twin room has a iPod dock, DVD player and CD player. 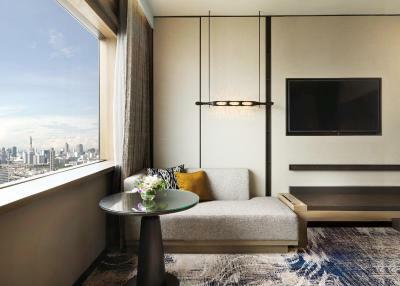 High above the glittering lights of Bangkok’s Chao Phraya River, all guest rooms offer a box office view over a rag tag of barges and canal boats that play the water way. 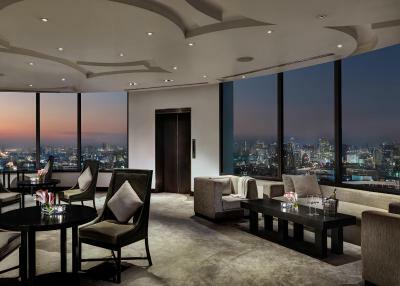 ThreeSixty Lounge on the 32nd floor boasts 360° panoramic vistas from its 130 metre tall. Wired internet is available in the hotel rooms and costs THB 272 per hour. 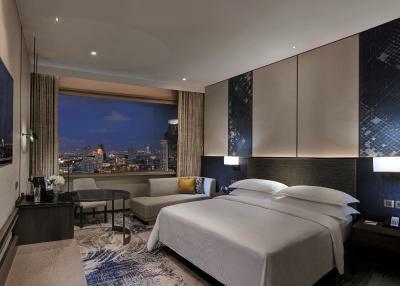 House Rules Millennium Hilton Bangkok takes special requests – add in the next step! Millennium Hilton Bangkok accepts these cards and reserves the right to temporarily hold an amount prior to arrival. Please be informed that the property is undergoing soft refurbishment works on the guestrooms from December 2017 until October 2018. During this period guests may experience light noise disturbances (no demolition or construction works will be involved). Facilities and services will remain unaffected and will operate as usual during this period. Placed in a room next to ongoing renovations. Woken up early both mornings by banging and drilling. Check in was very slow. Our suite was prepared for 2 guests, instead of 4 (not enough beds, towels, etc). Beautiful room. Great location on the river and next to Iconsiam. The breakfast is OK, but not like a "real" 5star breakfast. The room cleaness is fine, but the wall seems too thin, it is knid of noisy during the night. The pool is not clean. The location is great, and the hotel shuttle is really convenient. The hotel could be a little more helpful in helping their guests better understand the various options possible for traveling on the river. I was lost and it was difficult to get information since I don't speak the language. I've had better breakfasts at other hotel but it was okay. I did find it a bit difficult to see where everything was. They also used a lot of "finished" products versus fresh e.g. the juices. With respect to the location, it is good but most of things happen on the east side of the river and the hotel is on the west side. Nonetheless a great location. Staff was not particularly friendly, we we asked to pay more money to be in a room that had been renovated. Overall, quite an impersonal experience where you feel as one amongst many others. The hotel needs renovation but it was comfortable. Nothing as such. All is excellent!! Excellent! Best value for money!! Great location!! Choose as much highest floor as u can! I did not like that you couldn't remove the air con controller from the wall, so you had to get out of bed. The light switches were just annoying and confusing next to the bed. All next to each other, all look the same. Say you just want to use the bathroom during the night and you want to low light on. You press one of the multiple switches in the dark and the main light comes on and blinds you. My tv remote battery went flat just as I was falling asleep and I couldn't get it to turn off. Had to call the tech guy up which took quite a while, then I found it hard to get to sleep. The room doors are very heavy which made me think of how elderly people would manage them? I didn't like how there was no smoking area on the execute rooftop area despite there being ample room for one. If you were lucky enough to get a seat outside (they're weren't enough for everybody) overlooking the river, you then had to leave your drink because you're not allowed to take it with you to the rooftop bar next door, ask someone to mind your seat. Then walk back through the building to get to the other bar. So if you want a drink with your cigarette you are forced to buy one there. There were no slippers at the pool area. And a lot of gravel and dirt so you had to keep putting your shoes on and off if you were walking over to the day beds there which got annoying. I had checked out early then used pool, so couldn't access my room for slippers. I even asked, and would have assumed it would be easy enough to provide some, but no. Overpriced throughout- breafast almost £20 extra. Pop across the mall to pickup all meals for the day for half the price. Room goodies & Pool food unnecessarily high- 200bht for a fruit smoothie when you can pickup for 80 elsewhere for same quility. Great room with river view, super clean and comfy. Fantastic location on the river next to shopping mall, all places of interest accesible by boat. Very friendly helpful staff. Super facilities throughout hotel. Organised public taxi transfers for us. The pool was a little limited. Most beds are set in a paddling area over water. With electronic devices this was not ideal. Also there were only 4 proper sun beds that consistently got the sun. Great setting and the staff were Uber helpful. 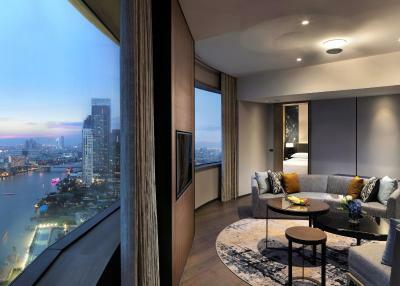 A touch of luxury only affordable in Bangkok! 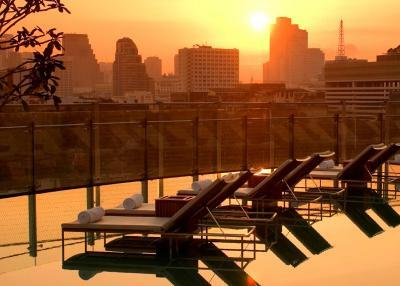 What better way than to enjoy Bangkok than working up a sweat touring all its cultural sites in the morning before relaxing poolside at the Millenium Hilton's excellent pool! The free boat transfers across the city are a great (and free!) experience! I don't like staff on reception, was dirty way talking like they my customer, not me, asked money for third people, but no any extra bed, and no any towels for third person till we call and ask few times, seems like hotel only focus on earn money on us not focus on service. Also hotel no elementary things tooth brush, we stay at 5 stars hotel and i should go to 7 eleven buy tooth brush, hmmm. In the end check out time staff on reception was not friendly, too dirty. Not recommend this hotel. I like location is ok there, nice rooftop bar, but beileys one bottle 7000 THB, this is 10 times more expensive then in shop, crazy. Security personal was very friendly. What else, that all. Thanks any way.